For casual gamers and regular entertainment buffs, nothing could be more striking than a screen with superior image quality with ultra-slim and elegant design language. With this particular notion in mind, ASUS turned up with an awesome budget gaming monitor featuring a wide view and seamless transition. With an unimpeachable Response Time of 1ms, ASUS VX 228H came to rule the budget-gaming-monitor industry with its super fast and fluid on-screen performance. So, without further ado, how about we try to ascertain the facts and features of this $120-priced budget monitor! ASUS did an awesome job in amassing this productive display in a black, shiny, and elegant housing. In relation to popular trends, the slim and sleek exterior of this gadget is quite pleasing to the eyes. The round-shaped stand is exceptionally sturdy. Surprisingly, contrary to the initial commencement, it is not feeble. More to the point, it does not wobble while typing hard and fast. However, the round-shaped stand seems to consume a bit more desk space compared to other conventional stands. In case you’re wondering, no, the stand is not detachable. Overall, this monitor is pretty appealing with its 21.5” display size and sundial edifice. The notion of a smaller yet fully-functional gaming monitor is simply epic! Bearing the gaming prerequisites in mind, ASUS designed this monitor with its original True-to-life pictures powered by LED. The 80,000,000:1 ASUS Smart Contrast Ratio is adequate to enhance the contrast via adjusting the luminance of the backlight. Ultimately, this formulation will allow it to deliver realistic images with featuring darkest black and brightest white. 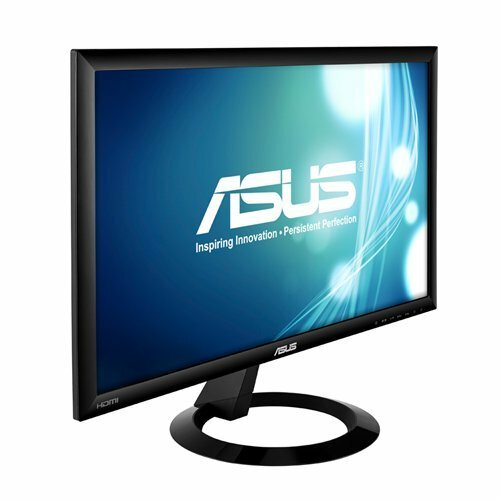 To bolster the Smart Contrast Ratio, ASUS equipped this 21.5-inch monitor with a Full HD 1920 x 1080p color resolution. Besides, the 4:3 Aspect Control Ratio will allow users to choose a preferred display mode. As a result, be it true-to-life gaming or watching movies, you can enjoy it without any data loss or image distortion. In any case, the highlighting attribute of this monitor happens to be its quick 1ms Response Time. For any gaming monitor, a fast response time can be counted as one of the most critical factors. Subsequently, this 1ms response time can eliminate the annoying ghosting and tracers for a seamless action playback. Concerning connectivity and multimedia gratification, ASUS furnished this monitor with rich alternatives. It comes with two HDMI ports, a VGA port, and ports for audio line out. It also comes with two 1.5W built-in speakers. ASUS’s exclusive video intelligence technology can optimize the image and video performance via six preset video modes. In addition, it has a 25-degree (5-degree forward, 20-degree backward) tilting angle. It incorporated ASUS Eye care technology with Low Blue Light and Flicker Free effects to reduce eye fatigue. By and large, ASUS VX 228H is the perfect amalgamation of a sleek design, dedicated technical specifications, and an reasonably lower asking price.